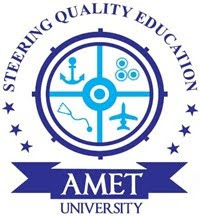 AMET University (Under Section 3 of UGC Act 1956) is a pioneer in Maritime Education in India. The Department of Biotechnology is seriously indulging itself in innovative and prosperous research in the field of Marine Biotechnology which is a undiscovered area in research studies. There is a huge prosperity which is hidden deep under the ocean, so we are on a progress towards unveiling this treasure. As a part of our research extension programs, we are conducting series of workshops for introducing Marine Biotechnology, which is a prosperous field in science. The workshop will give hands on training in the following technical aspects. Molecular Biology: Isolation and quantification of macromolecules: DNA, Proteins-Intracellular, membrane bound and extra cellular. Electrophoresis. Note: All the organisms used in the workshop would be Marine Microorganisms. But the techniques are applicable to all kinds of Microorganisms. Payment mode : DD in favor of AMET payable at Chennai. Accommodation: Limited accommodation is available on payment basis at Campus Hostels. However, the accommodation requirements are to be made well before August 20, 2010.